Punching and hitting things you shouldn’t out of frustration is a tradition nearly as old as sports. Gatorade coolers, lockers, helmets; nothing is safe when an athlete is having a particularly bad day. Apparently, that rule applies to sports executives as well. 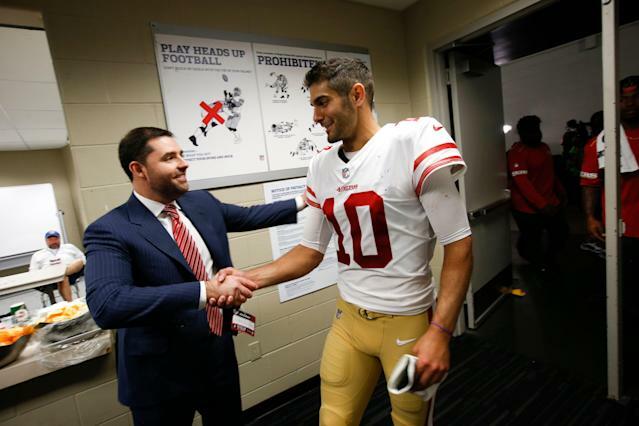 San Francisco 49ers CEO Jed York revealed his own tale of woe and punching during Sunday’s NFL owners meeting, per NBC Sports Bay Area’s Jennifer Lee Chan. It’s probably not hard to guess what moment led to York’s moment of violent anger, as there was a singular moment in which the 49ers’ playoff hopes effectively died: Jimmy Garoppolo’s torn ACL. That’s all somewhat understandable as far as these things go. The 49ers gave up a second-round pick for Garoppolo, watched the quarterback flourish in a half-season of work, then handed him a five-year contract that made him one of the highest-paid players in the NFL. They had a lot riding on his health. And then the team went 1-2 out of the gate in 2018 and lost Garoppolo for the season, eventually finishing 4-12. York likely knew what was coming when he heard the news: a season of C.J. Beathard and Nick Mullens under center. Then again, moments like that are also when you might want to project confidence that the organization still has a plan going forward, lest the dysfunction becomes a self-fulfilling prophecy. Seeing the team’s CEO walk around with ice on his hand probably didn’t accomplish that.